Shipping freight to Mexico from the USA is a complex process. 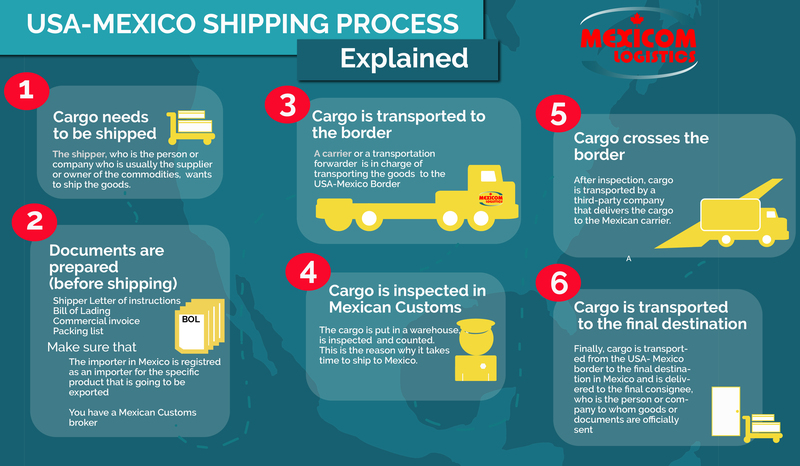 In this post, we explain every step involved in the process of shipping cargo to Mexico and we include an infographic, that we hope you will find useful. The shipper wants to ship the goods. The shipper is the person or company who is usually the supplier or owner of the commodities. The Shipper Letter of Instructions (SLI) needs to be prepared. The SLI instructs the freight forwarder on how and where to handle the export shipment. Bill of lading- Is a Legal document between the Shipper and the Carrier that details the goods, the quantity, origin and the destination. Commercial invoice- A legal document between the supplier and the customer that describes the sold goods, and the amount due on the customer. Based on this document, customs determines customs duties. Packing list- Includes the information about the contents of the (load or cargo) package on regards of weight, # of pieces and product name and informs transportation companies about what they are moving. A carrier or a transportation forwarder is in charge of transporting the goods to the USA-Mexico Border. 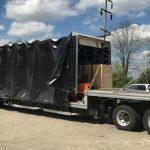 It can be transported in a variety of types of equipment, such as Dry Vans, Flatbeds, Double-Drops, Step-Decks, Reefers, among others. The cargo is put in a warehouse, it is inspected and counted. This process takes time and this is the reason why it takes time to ship into Mexico. After inspection, cargo is transported by a third-party company that delivers the cargo to the Mexican carrier. Finally, cargo is transported from the USA- Mexico border to the final destination in Mexico and is delivered to the final consignee, who is the person or company to whom goods or documents are officially sent. In this step, the Bill of Lading is signed and works as a receipt that proved that the goods have been delivered accurately. 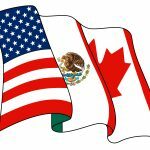 If you have questions about the process, or you need to ship goods from Canada or the USA to Mexico, contact us or send us a quote request, After 13 years of experience moving freight to Mexico, Mexicom Logistics have mastered the Mexican crossing-border and we will be very happy to help you with your loads.